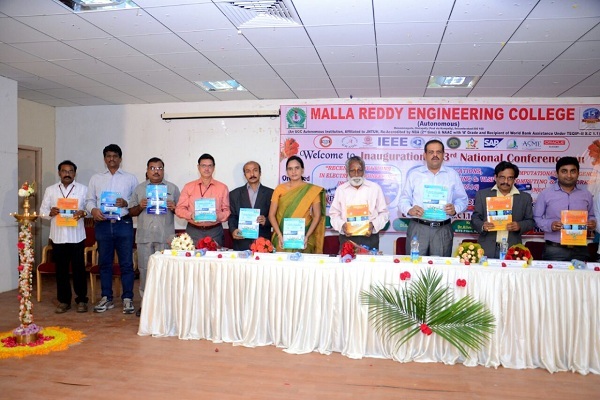 Malla Reddy Engineering College (MREC) has successfully organized a First International Conference on Emerging Trends in Science Technology Engineering and Management (ICETSTEM 2015) on 09th & 10th Oct 2015 on its own sprawling campus of 1000 acres. Conference is aimed to provide a platform to discuss emerging trends in Science, Technology Engineering and Management and other multidisciplinary areas. Conference tracks are categorized into 7 tracks with individual themes namely, Civil Engineering, Electrical & Electronics Engineering, Electronics & Communication Engineering, Computer Science Engineering, Mechanical Engineering, Humanities & Sciences and Business Administration for effectively handling theme wise ideas. Papers are received from various sections of contributors including Industry, Research & Development Organizations, Academic staffs and research students. The conference received more than 250 papers and 152 papers are shortlisted for oral presentation, Authors from more than 15 states participated and presented their papers apart from contributions from many foreign countries. MREC used the Grammerly tool to check the plagiarism level of the submitted papers. All the papers scrutinized, peer reviewed & shortlisted are published in the ICETSTEM-2015 conference proceedings to benefit the researchers and student community. ICETSTEM-2015 is organized by getting the support from TEQIP funds, for improvement in quality of education, particularly for the Autonomous institutitions like MREC (A). Management also supported the conference requirements by various means. On the day of inauguration Dr. Anji Reddy, Director, R & D, JNTUH, presided over as Guest of Honor and senior most Scientist Dr. B. Venkataraman, DMRL also shared his knowledge on various materials. Dr. Sudhakara Reddy, Principal, MREC (A), gave his inaugural conference speech. Senior Scientists from various R & D Organizations gave their presentation for the benefit of authors and also acted as session chairs for various sessions. Academicians & Professors from state of the art institutions like IIT, Hyderabad are also acted as session chairs and evaluated the research papers of authors presented in the conference. Management encouraged, the administration, senior staff’s and other associated staff’s in going for the future international conference like this during the year 2017. The vast experienced gained through this conference is definitely helpful in conducting successive conferences successfully.